Prizmatix Implantable Fiberoptic Cannula for optogenetics allows direct stimulation of target deep brain tissues in freely moving animals. 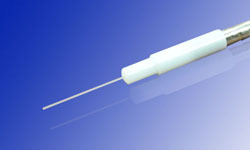 Each Cannula consists of a Zirconia ferrule and a high NA optical fiber, protruding at desired length. The fiber is optically polished both ends to ensure high quality optical coupling and reliability. All cannula components are biocompatible, implantable and non-metallic, and are NMR/MRI compatible. 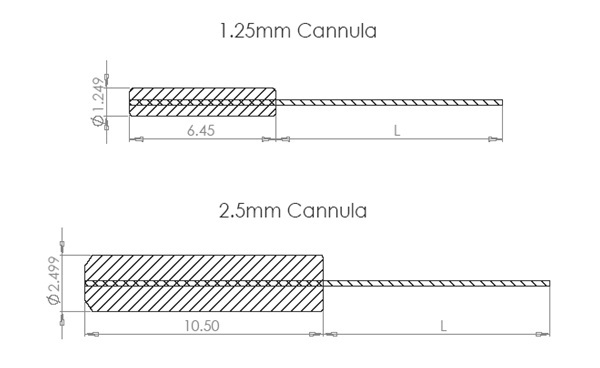 Standard and custom built cannulae are also available in two ferrules diameters: 2.5mm and lightweight 1.25mm for smaller animals as mice. Zirconia ferrules - 2.5mm or lightweight 1.25mm outer diameter e.g. for mice. 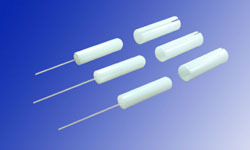 High NA fibers – 200μm (NA 0.66), 250μm (NA 0.66), 500μm core (NA 0.63). Adheres to the cement fixing the cannula to the skull. NMR compatible, no metallic components. Sterilizable - alcohol, ETO, autoclave (65°C / 1 hour cure). 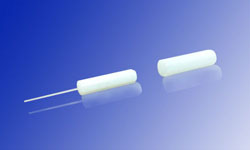 A special custom Peripheral Nerve Implants are available. Please contact us. 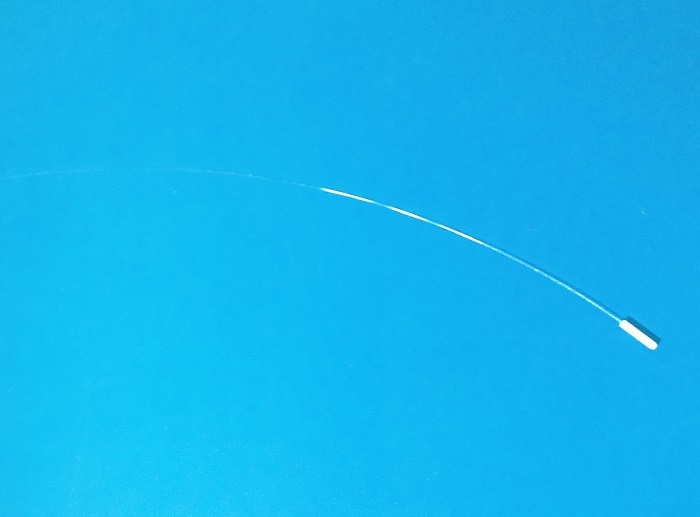 L - Fiber length protruding from cannula. See specification table for details. Zirconia and metallic mating sleeves for cannulae are available from Prizmatix. Thank You! Your RFQ has been sent. Prizmatix Cannulae are specially designed for working with high NA fibers and LED light sources. Unlike lasers, Prizmatix Ultra High power LEDs have a high brightness large emitting area and wide angle radiance. We use this characteristic to couple the LED's light efficiency into a high numerical aperture (NA ≥0.5) primary large core fiber, e.g. 1000μm - 1500μm core. Due to the large core of the primary fiber, coupling of the secondary fiber (NA≥0.5) with smaller core, e.g. 500μm, does not require precise axial alignment. Having the fibers close enough to each other, just keeping the small core in front of the larger core still keeps efficient light transmission..
With Prizmatix Rotary Joint for in-vivo experiments, the primary fiber is connected to the stationary top port of fiberoptic rotary joint and the secondary fiber is connected to the rotating output port at the bottom of the rotary joint. Prizmatix Rotary Joint consists of a special low-friction ball-bearing enabling the two fibers to rotate freely upon each other. The brightness, usually measured in mW/mm², is basically conserved along the fiberoptic chain from the LED light source towards the rotary joint and the implanted cannula, provided the Numerical Aperture (NA) is preserved and despite the fact that core diameter of the fiber optic components in the system gets smaller. The large core to small core(s) coupling method allows the secondary fiber to have more than one branch, still using a single LED light source and without compromising the brightness. This is very useful for comprehensive research, such as bi-lateral optogenetical manipulation of two brain hemispheres or at several locations simultaneously. Prizmatix Rotary Joint is suitable for systems based on LEDs and high NA fibers as Prizmatix offers in the Optogenetics Toolbox The high NA-Cannulae are the last component in this fiberoptic chain, exploiting the most of Prizmatix optogenetics LEDs. Prizmatix offers a full range of modules for in-vivo Optogenetics starting from the single wavelength plug-and-go Optogenetics-LED to multi-wavelength systems for activation and silencing, with speeds of better than millisecond-scale temporal precision.